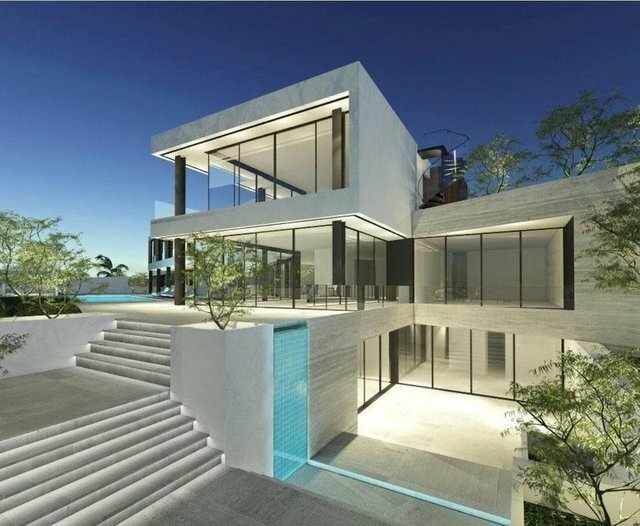 A stunning contemporary villa with magnificent sea views is offered in shell to be built and ready for finishing by December 2018. The main living area of the villa surrounds a large swimming pool. Accommodation consists of a large living room connected to an equally large sitting room area. Interconnecting is a dining area next to an equally impressive kitchen area. Other additions include a further kitchen, store rooms a staff apartment, wine room, guest toilet and a ground floor bedroom with ensuite which could equally be used as a boardroom. On first floor level the property boasts an amazing main bedroom suite with dressing room and en-suite, five further bedrooms all with en-suite and a guest apartment. The huge basement houses staff quarters, cinema room, gym, sauna, spa room, changing rooms, Disco room, squash court, huge games room, washroom, guest bathroom and several store rooms. There is also a large garage complimenting this amazing property. Please contact us for plans and further illustrations.